-- Select a Size -- Size 8 Size 10 Size 12 Size 14 Size 16 - Out of Stock! Size 18 Size 20 Size 22 - Out of Stock! Size 24 Size 26 - Out of Stock! Size 28 - Out of Stock! Don't let cold weather keep your pup from having fun. 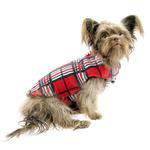 Warm up your four-legged friend with the Whistler Winter Dog Coat in Red Tartan! Now dogs of all sizes can brave the elements with this comfortable double fleece jacket by RC Pet. 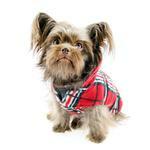 These great-fitting dog coats are durable, reversible, and machine washable. With printed tan tartan brushed fleece on the outside and cozy, solid gray fleece on the inside, this jacket is sure to provide optimum warmth. T-Fit chest panel featured on sizes 8-20 have two points of adjustability to fit more doggy shapes. The cozy dog coat features contoured darts at the bottom for a nice fit. T-Fit chest panel featured on sizes 8-20 have two points of adjustability to fit more doggy shapes. Sizes 22+ exclude the chest panel for an optimal fit for large breeds. 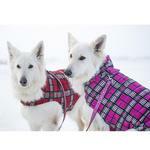 Whistler Winter Dog Coat - Red Tartan Customer Photos - Send us your photo! Lucas is 17 months and is motivated by the ball. We never miss a day at the park. Today is 3 degrees with wind chills as low as 25 below zero. Sayde is not looking forward to going outside, but the Whistler Winter Dog Coat makes it more bearable. Finding a coat that fits a mini dachshund can sometimes be a challenge, but this one fits her perfectly. Posted On 02/20/19 by Jen L from St.Thomas, Yes, Jen L recommends this product! Whistler Winter Coats are the best fitting for Weims! Posted On 11/19/17 by Marcy M from , NH Yes, Marcy M recommends this product! I have tried dozens of coats from all companies and price points, and have found nothing fits as well as the Whistler for my 75 pound Weim. He has a deep barrel chest and the velcro on these coats is superior to any other. In fact, I've now purchased three! Posted On 05/12/17 by Carol J from , Yes, Carol J recommends this product! I love your products! This order included a tough toy, the junior ring. Our dachshund loves this toy and will often bring it to us so we'll play with him! Though a small bred, our dog is able to destroy toys unless they are ropes. This ring gives him another type of toy for play.